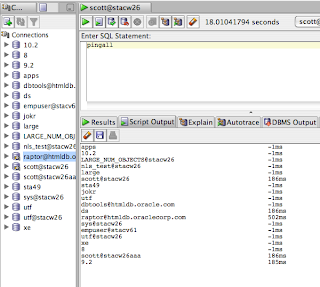 I forgot I added a real simple way to see what DBs are up in sqldev a while back. If in the worksheet, you run a command, F5 (run script), "pingall" it will do a tnsping of all the connections defined and report back. From this screenshot you'll notice most of my DBs are down. My plan was to hook up an indicator in the tree for down database but never got it well tested.